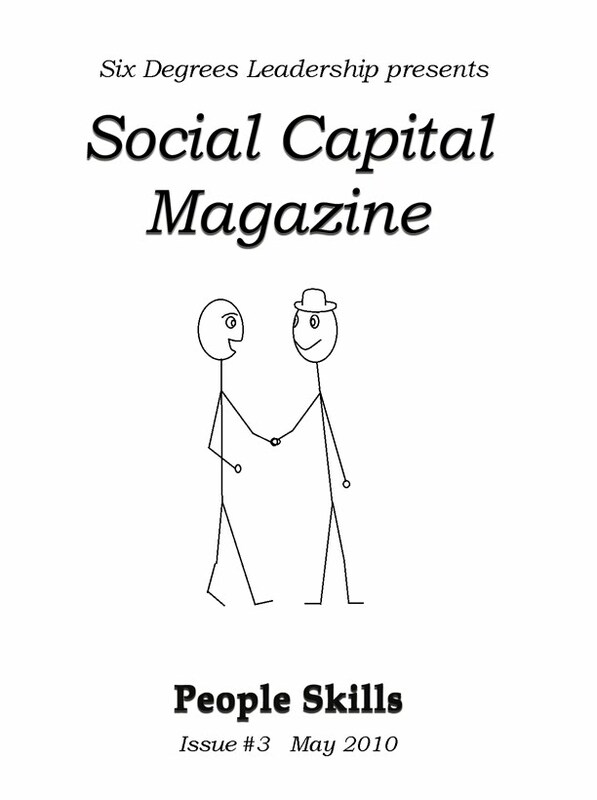 Social Capital is the collective value of all your relationships and is measured by the effectiveness of those relationships. There is no part of the human experience that is not enhanced by the ability to build effective relationships; from your relationships at home to the money in your bank account. Skills, by definition are things you can get better at. Building relationships is a skill worthy of your best efforts. It is the foundation of fulfillment in life. 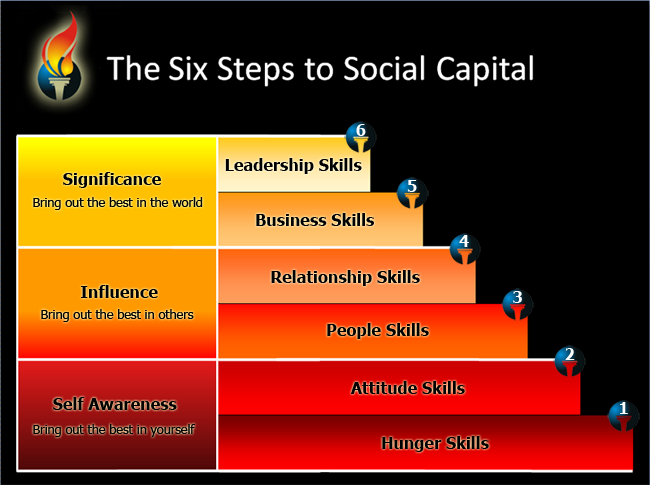 There are Six Steps to Social Capital. Mastering these steps will increase your leadership ability and produce the fruit you want most in your Social, Physical, Mental, Political, Spiritual and Financial life. 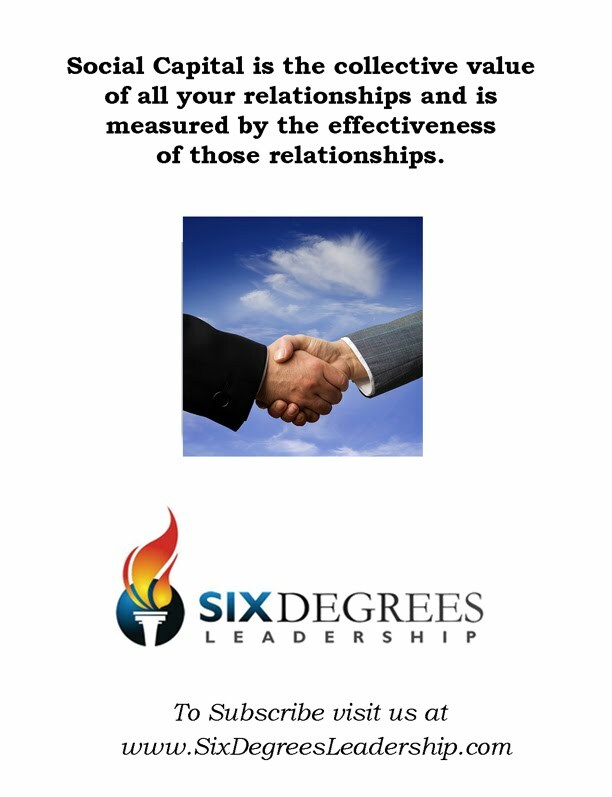 This first step of the Six Degrees Leadership People skills stands on Socrates’ guiding rule: Know Thyself. o Know who you naturally rub the wrong way and why. o Know who naturally wants to connect with you and why. o Know why there are some people that just rub you the wrong way. o Know why there are some people you want to connect with instantly. The root of “Know Thyself” is understanding our behaviors or you might call it the foundation of our personality. We all have behavioral tendencies that are either productive or they are not. The more aware we are of our behaviors, the more we can adjust them to be effective in our relationships. There are hundreds of behavioral assessments you can take on line – try out some at www.humanmetrics.com, or for fun, you can find out what type of dog you would be at www.dogster.com . Some of these personality/behavior assessments get very detailed on each personality while others are very vague. Some of these assessments label you with letters and put you into boxes by saying things like, “You are this types, and you always act like _________.” We don’t agree with the term ‘always’ and putting you into specific categories. Our belief is that although you may have specific tendencies or preferences, you can flex your behaviors to fit the situation. The struggle, however, is that this flexing exhausts your personal energy; you get tired quicker or burn out easier. For example, if you are not typically a sales person and are trying to do sales, the cold call process could be exhausting for you, or you might procrastinate doing the calls. If you are not detail oriented or technical in your behavioral make up, doing the paperwork or detailed process work of your business may make you feel like you are trudging through a sand pit. Believe it or not, there are people who love to make cold calls and others that love paperwork. So, what makes us all so different? Research shows that 70% of our behavior/personality is genetic or nature (thank you mom, dad, grandma, and grandpa) and the other 30% is nurtured or influenced by significant life moments or other people. Can you identify what parts of your behavior/personality come from your genetic make-up and which parts are nurtured? Any behavioral/personality assessment is fun to take and could provide you with some insight into who you are and why you do certain things. After you take one of them, take a minute and think, “Is this really me? Do other people really see these tendencies in me?” You might find some trends that will help you ‘Know Thyself’. This activity will certainly give you a more objective view of your behavioral and personality tendencies. Need for Control (The Driver): The need to control the environment around them. The Drivers like attaining goals, end results are always in sight and enjoy leading projects and initiatives. Need for Harmony or Peace (The Peacekeeper): The need to ensure that everyone gets along together. The Peacekeeper is typically reserved and avoids confrontation. They bring a calming effect to every situation. Need for Stimulating People Interaction (The Enthusiast): The need to be interacting with people anywhere, anytime. The Enthusiasts are sometimes referred to as extremely conversational, sometimes chatty. Need for Quality Answers, Details, and Correctness (The Thinker): The need for qualified information, everything being in its place, details being addressed, and life being neatly organized. Who would be driving the car? Who would make sure that everyone was getting along? Who would be keeping the conversation lively? Now that you are familiar with the behaviors, let’s look at how to measure your behaviors. Every day we need to use a combination of these behaviors to be effective in our relationships. Let’s look at how this works. On the graph below, rate the amount of the trait you believe describes you best. You can plot yourself anywhere on the line from 0 to 10; zero being none of the description to 10 being everything in the description. Once plotted, connect the dots. We have provided you with an example. This person is primarily an Enthusiast with Driver traits. Why is this so important? Let’s say that your customers are Peacekeepers, Thinkers and you are a Driver with Enthusiast tendencies. You are struggling to make sales to your customers. It might be your personality that is getting in the way. The graph below represents the shift you need to make to meet your customers from where they relate (from a behavioral perspective). Shifting your communication to match their personality could be a simple change that will increase your effectiveness and your sales. You are represented by a solid line and your customer is the dotted line. In the above scenario, you, as an Enthusiast-Driver need to think about some things you can do to communicate effectively with a Thinker-Peacekeeper. Just having the thought of how to communicate effectively will tone down your behavior. If you’re thinking about communicating in a more detail-oriented way, your speech will slow down a bit, making you less audibly enthusiastic and excited as your normal tendency. Remember, it’s our natural tendencies that rub people the wrong way or make them want to connect. An easy thought in the shift of our communication can make all the difference. Plot your graph and then what you believe is the other person’s natural behaviors. You will find that ‘Know Thyself’ is critical as a People Skill. Enjoy using this tool to be more effective in your relationships. Victoria is an expert on business referrals and speaks nationally on the topic of referral marketing. As the owner of Referral Institute of Central Arizona, she has helped hundreds of business professionals create millions of dollars in qualified referrals. She is part of an elite team of Master Trainers and trains Referral Institute franchise owners and trainers worldwide. Victoria is a certified Behavioral and Values Analyst. To subscribe to her newsletter or request information on training and consulting, contact Victoria@Referralinstituteaz.com. Communicating with Style… are you a hit or a miss? Good communication skills are critical to success in business and life. Leaders need to be great communicators to inspire their followers. They need to communicate an inspiring vision, a compelling mission, and clear goals and objectives. To succeed through the efforts of others, they must communicate effectively. Referral masters and leaders have similar challenges. You have to inspire others to want to refer to you, you have to communicate a compelling vision that will generate referrals to the right people, and you have to train others on your referral process. Referrals are a team sport. Generating good business referrals from others requires effective communication. Referral Institute teaches behavioral style because communication depends more on behavioral style and less on what we say… That’s right. It is how we say it that counts! People are a unique combination of four different behavioral styles. Behavioral style determines how leaders should communicate with someone based on their preferences. People with different styles are motivated by different things. Behavioral style dictates preferences for details or high level concepts, long conversations or written information, fact finding or idea generation, and many more factors. The purpose of this article is to help the reader understand the high level preferences of each style to communicate more effectively. This style is task oriented and fast paced. They are typically in charge and come across as authority figures. They are generally all about business, especially in work settings. don’t try to argue their points. get buy in, not just their cooperation. This style is people oriented and fast paced. They are fun loving and expressive. They love ideas and possibilities. They are expressive, enthusiastic, and optimistic. § do make them laugh and they are yours. § don’t be negative or pessimistic. finish one topic completely before switching to a new topic. This style is people oriented and slower paced. Peacekeepers focus on relationship first. They think things through before responding. They are great listeners and love helping others. don’t ask them to think and reply on the spot, brainstorming sessions are very difficult for them. be open to new ideas and look at change with an open mind. This style is task oriented and slower paced. Thinkers want a lot of information, preferably written. They are quality oriented and like to work alone. They do a lot of research before making a decision to make sure they have all the facts. don’t push them for fast decisions. talk about the impact of decisions on people and allow others to express their feelings. As you can see, communicating with all four styles requires adapting to different preferences. Many of us can “read” the other person and know if we are getting “buy-in”. It is difficult to read all styles unless you are trained in behavioral style. There is typically one style that is opposite and very different from you. The best advice is to have the right intention when communicating with others and ask for feedback on their understanding and agreement or disagreement with what you are staying. If you practice the Platinum Rule and treat others the way they want to be treated, you will be a great communicator and leader. Self-interest can be a deep and touchy subject, so let’s jump right into the middle of it. Everything you do is because of self-interest. If you give to charity anonymously and never tell a soul (to include the government for tax purposes) it’s your self-interest in obtaining the feeling you get from giving. If someone holds a gun to your head and tells you to eat dirt, it is not the person with the gun who is making you eat dirt, it’s your self-interest to live. Even in ineffective or destructive behaviors, there is always a payoff for ourselves in the end. Some people will subconsciously sabotage their own success because they are addicted to receiving sympathy. Some people like the emotional release of getting angry, or the euphoria of making up. But, rest assured, there is some payoff in everything we do. You can see how this topic can get very deep and touchy rather quickly, as it’s not something we think about often, and, in many cases, the payoff is not obvious. The point is this: everything we do is for our own self-interest one way or another, so identifying what those self-interests are is very important. First, we must eliminate the ones that don’t serve us and increase the ones that do. For example, there are many people who want to be rich (a long-term payoff) but they use their money to buy liabilities that go down in value, primarily for comfort or status (short-term payoff). This is an extreme example, of course, but you get the idea of how you can find more subtle examples in your own life. Now that we’re together on the scope of positively influencing your self-interest, let’s take a look at what you want. At some level, everyone wants wisdom or insight, the understanding that is required to truly obtain the things we want in life. When we say that someone is wise, it is usually because of their knowledge about people and relationships. Dictionary.com says insight is “a. an understanding of relationships that sheds light on or helps solve a problem. b. the recognition of sources of emotional difficulty. c. an understanding of the motivational forces behind one's actions, thoughts, or behavior; self-knowledge.” Typically, we do not think of someone who is wise as a person who “flies off the handle”, “ reads the riot act”, “blows their lid”, “bites your head off” or “lets you have it”. It’s funny how many phrases we have for this behavior. The reason that a wise person is not associated with these phrases is that they understand that those behaviors do not serve them. These are examples of negatively influencing your self-interest. 1. Hurting people, hurt people. In other words, people who are in pain will almost always try to inflict pain on others. 2. People have different personalities with different objectives and motivations in life. Just because someone is more task-oriented (Drivers and Thinkers) and you may be more people-oriented (Enthusiasts and Peacekeepers), it doesn’t make them, or you, wrong. On the other hand, just because someone may be more extroverted or outgoing (Drivers and Enthusiasts), while you may be more introverted or reserved (Thinkers and Peacekeepers) doesn’t make one better or worse. All personality and behavioral tendencies have effective and ineffective traits. It is up to you to find the effectiveness in each of them, especially when someone is getting under your skin. The better you get at ‘knowing thyself’ and practicing your communication with style, the more centered your personality will become. As mentioned before, you are a unique combination of all four personalities. When you use them effectively to positively influence your long-term self-interest, you begin to bring out the best in others and to leverage your influence.